Thanks to Chalkola for providing me with product for this post. All thoughts are my own. One of my favorite things about fall is fall decorating. I love all of the beautiful decor that I see in craft and home good stores, but they often come with hefty price tags. Even when some items are 40 - 50% off their regular price, two or three items can add up fast at the cash register. 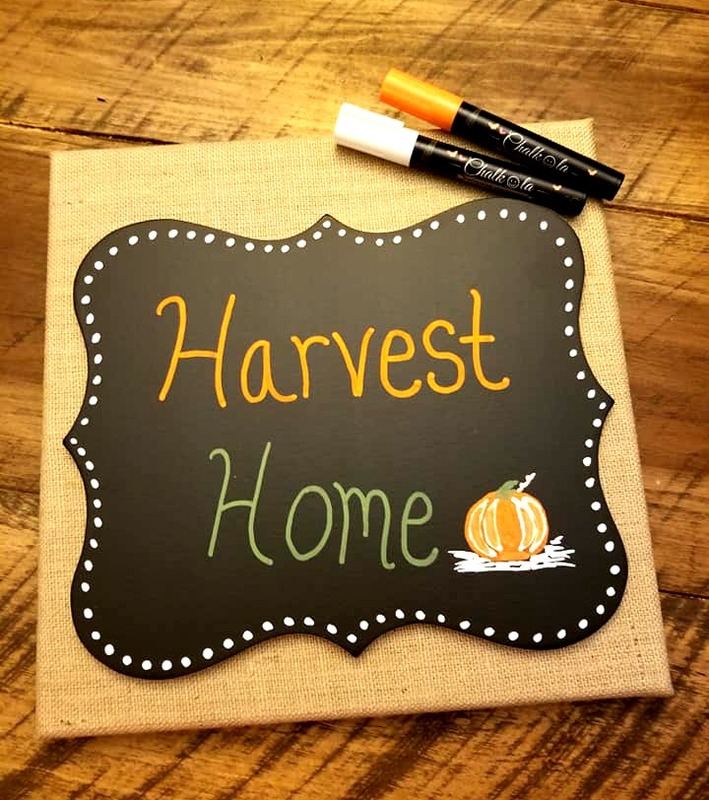 I've found that it's so inexpensive and easy to make my own decorative pieces for my home, especially by using chalk markers. I fell in love with chalk markers a while back, after putting up a chalkboard calendar in our family kitchen. It's so easy to decorate it with little doodles, as well as keep our family's info up to date for all to see. Chalk markers are so much easier to write or draw with than traditional chalk, and if you haven't noticed, chalkboard decor is super trendy! Not all chalk markers are created equal. I have spent a lot of money on large packs of chalk markers in the past, and they have been difficult to use or have performed quite poorly, with some even drying out/up far too quickly. Chalkola gives its customers premium liquid chalk pens/markers that are perfect for at home use, use in classrooms, on craft projects, etc. They're also perfect for businesses, and for creating boards for special events. 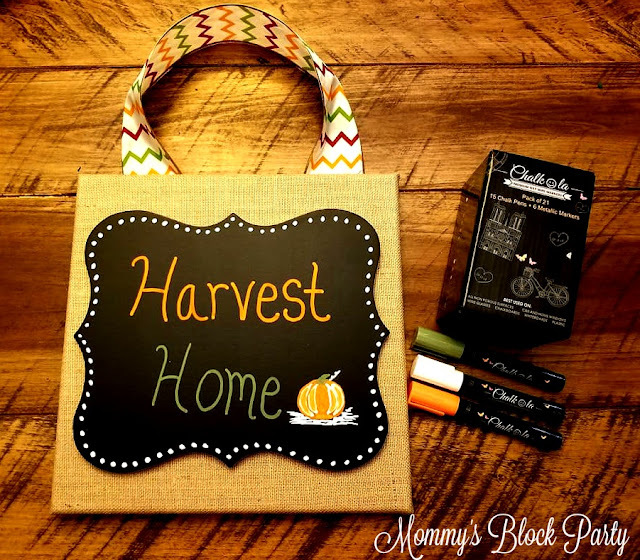 I had the chance to try out Chalkola markers for myself and thought it would be fun to create a fall decor piece for my home. Now, keep in mind- I'm not an artist, and lettering just isn't my thing, but I was able to create a cute, fun project with a few simple items from my local craft store and a pack of Chalkola markers. Start with the chalkboard design first! Before I did anything, I focused on adding my design to the chalkboard. This was a $4.00 chipboard coated in chalkboard paint, purchased at Hobby Lobby. I chose the chalk markers I wanted to use for my design, and set those out for my project. To prep the markers for use, I simply followed the directions on the box of chalk markers. I shook each chalk marker in an upright position for about 30 seconds (with the cap on), and then removed the cap, and pressed down on the marker (on a paper towel) until the liquid chalk began to flow. The markers were incredibly easy to use, and they kept a good flow the whole time I was using them. I didn't have to keep going back and pressing down on the markers or shake them again to get the chalk ink to come out. I realized later that I should have used a ruler to keep my writing straight, but, oh, well! I loved how easy it was to both write and draw with the Chalkola markers. The best part is, I can use this board over and over again if I simply wipe away what I drew or wrote for this design with a damp cloth. I will probably make a new sign for Halloween in a few weeks. I attached the chalkboard to the burlap wrapped canvas with hot glue, and then added decorative ribbon (also with hot glue) to hang the canvas. You could add the ribbon directly to the chalkboard and hang it that way, too. I liked the mixed media look of the burlap canvas behind the chalkboard to give it another dimension. 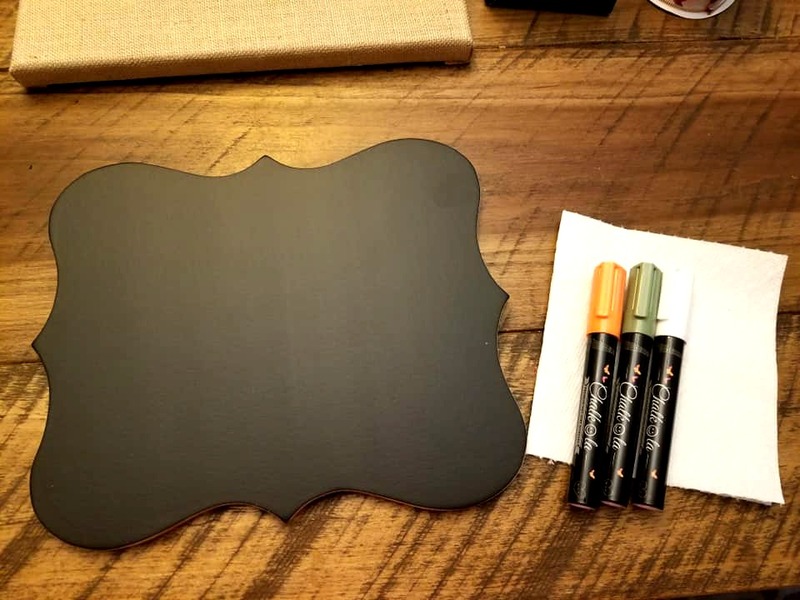 If you're looking for fun and easy ways to decorate, or if you love to make homemade crafts or gifts, you will definitely want to have Chalkola chalk markers on hand. I love the colors- they're very bold, which is awesome! Most all of the chalk markers that I have had in the past have wound up looking very neon, which was disappointing! These colors are very true to what you see on their colored caps. The markers are great for any kind of Non-Porous Surface (Like Chalkboard, Windows, Labels, Jars, and Paper etc.). The Pens are safe for kids, non-toxic, water-based - Wet wipe and can be erased easily using a wet cloth. I am loving my Chalkola markers and can't wait to create more fall and holiday projects with them. The Chalkola website has a lot of wonderful project photos which will likely inspire you to get crafty! These markers are also wonderful to have on hand if you have a chalk wall or chalkboard at home, in your classroom (if you're a teacher), or if you entertain or host parties. 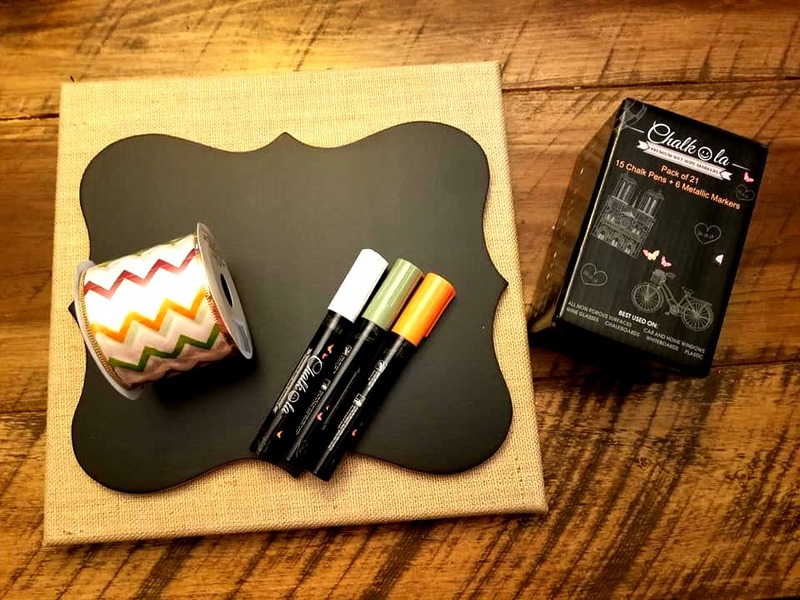 Head on over to Chalkola for more info about these amazing chalk markers. 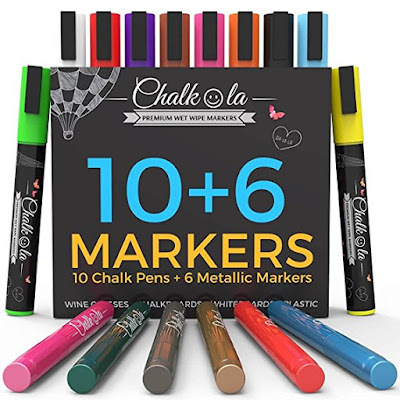 Chalkola markers are available for purchase on Amazon. Available in the US, UK & Germany. 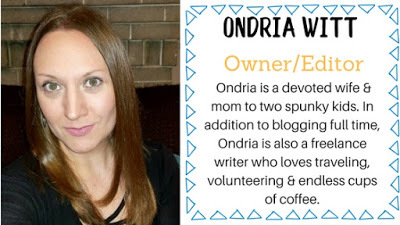 Connect with Chalkola on Facebook, Twitter, Instagram, Pinterest & YouTube. 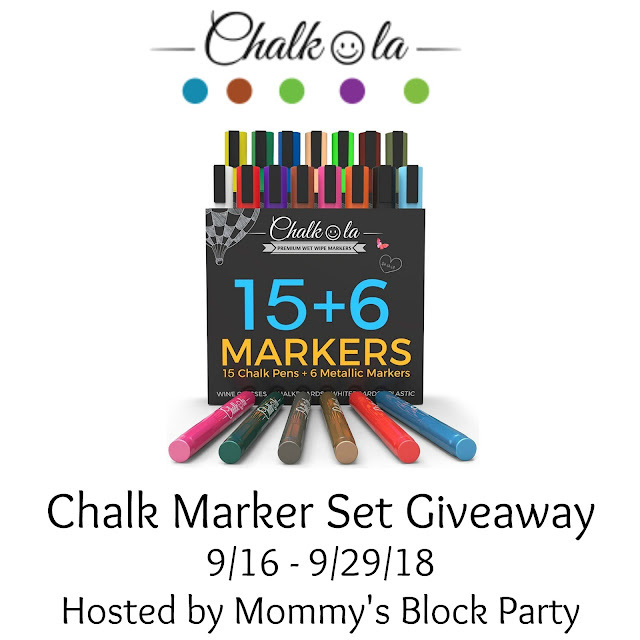 One lucky MBP reader will win their own pack of Chalkola Chalk Markers! Just use the handy RC entry form below for your chance to win! Please kindly remember that MBP or any participating bloggers are not responsible for prize fulfillment. Special thanks to Chalkola for sponsoring this awesome giveaway! I would create a menu board. I would love to do that for my kitchen! Great idea! I want to create a sign for Thanksgiving. A milestone board for my kids! I would also use these for Christmas gifts. My Granddaughter would love to create a dinner menu board every night! She loves to hand write it, I would get her a chalk board to use. I would love to create some markers for my fall garden. I also want to create my own design on some of my pots for my houseplants. I will give them to my son to use in his classroom. I can use them for decorations. I'd make some homemade greeting cards. I usually like to color or draw landscapes and think that's what I would create. I'd use it for DIY's! I would create a banner for fall. I would create nice holiday banners. I would make place cards for my Thanksgiving table. I would use the markers for Christmas cards. I would make Holiday decor with these and do my windows! I would also use in my planner to make it more colorful. 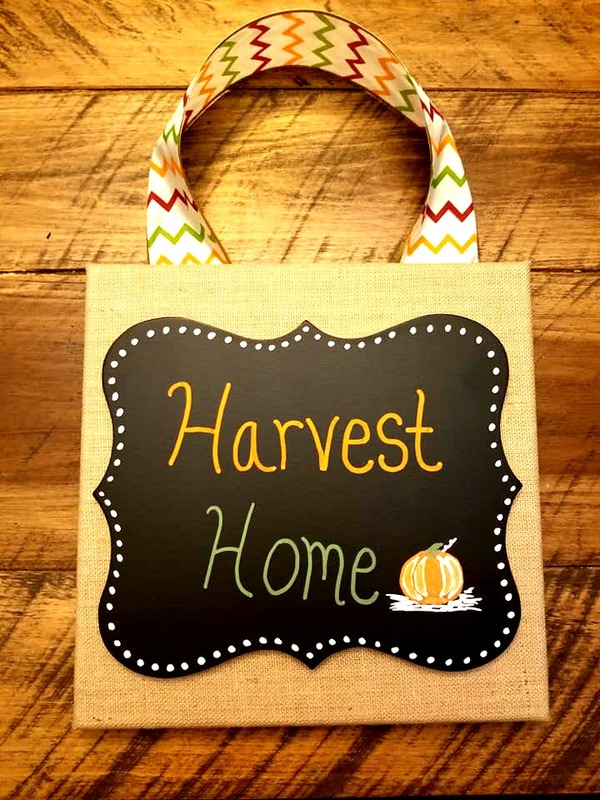 This would be cute to hang on our front door with a fall message! I would use them for creating Thanksgiving and Christmas, like signs, glass with ornaments inside with a quote written on outside (something on my challenge to do this holiday list).